With the wide range of rechargeable electric toothbrushes in the market, it may be a little confusing what to get. That is why I decided to put together this Oral B Pro 3000 review. There are a number of toothbrushes that offer over-the-top features, but of course, come with higher prices. But for the types that would rather only pay for the features that he would use every day or just a little tight on a budget, then looking into Oral B Pro 3000 toothbrush can be a wise choice. This toothbrush offers features that you would need to be able to have cleaner teeth and healthier gums. Though it may come with just basic features, its cleaning abilities are far from being simple. With its advanced cleaning technology and rounded brush heads, it can whiten teeth in just two weeks and give you healthier gums in a just a month by removing all plaques in between your teeth and gum line. With much more consistent use, this toothbrush promises to improve the overall condition of your teeth. Featuring the OralB technology that provides 40,000 pulsations and 8,800 oscillations per minute, OralB Professional Care 3000 is undoubtedly equipped with a powerful cleaning technology that works up to the deepest areas of your mouth, leaving it cleaner and healthier. The technology helps break and sweep away all plaques in between your teeth and gum line, reaching even the hard to reach places giving a true complete cleaning. It works with much precision, getting rid of up to 97% of plaques. This keeps cavities from forming and reverses gingivitis. With consistent use, you can already enjoy whiter teeth in just two weeks and healthier gums in a month. To ensure its brushing effectiveness, OralB Pro 3000 comes with a Professional Timer so that you can keep track of your brushing time. This timer option monitors your brushing per quadrant, giving a short sound every thirty seconds that signals you to move to another quadrant. It will send along sound to indicate that you already have completed the recommended two minutes. If ever you need to pause from your brushing routine, you can briefly switch the toothbrush off as the handle can memorize the elapsed time. However, it will automatically restart the timer if you switch it off longer than thirty seconds. To address our different dental needs, this toothbrush offers three brushing modes. Daily Clean Mode – this mode is recommended for everyday tooth cleaning. It provides complete and thorough brushing to ensure that your teeth and gums are freed of any plaque. Sensitive Mode – for people with sensitive teeth or gums, this mode is very advisable to use. It offers gentle brushing, but still is very thorough when it comes to cleaning to keep your pearly whites clean. There used to be a Whitening Mode but it has been replaced by Gum Care mode. If teeth whitening is important to you, you should consider choosing a more advanced model from Oral B lineup. It can remove teeth stain to reveal your teeth’s natural brilliance. Oral B 3000 automatically sets itself to Daily Clean mode when turned on for the first time. If you want to choose the sensitive or whitening mode, you just have to press the on/off button successively. If you want to turn off the toothbrush from the whitening mode, just press the on/off button once again. On the other hand, if you want to turn off the toothbrush from daily clean or sensitive mode, just long press the on/off button until the motor stops. To keep your brushing techniques effective, Oral-B Pro 3000 is equipped with a pressure sensor to let you know when you are brushing too hard. This helps avoid sores and inflammation. In an effort to help you monitor your brush head changes, all OralB brush heads have an indicator bristles that fade halfway to remind you that your current brush already needs a replacement. For a regular user, typically, this will take up to three months. The whole package is 4 x 6.9 x 10 inches and weighs 1.3 pounds. The design of this toothbrush is fairly simple. The front of the handle, where the on/off button and indicator light is placed, is clothed in dark blue while the rest of the handle is in light blue. The handle seems sturdy enough to give a good grip and prevents it from falling off of your hands. It also seems to be just the right size so you can comfortably grip and use it. Based on the Oral B 3000 reviews from users, they are truly satisfied with toothbrush even if it does not boast any over the top features. One of the many great feedbacks given to the model says that its powerful technology delivers to its complete mouth cleaning promise. After every use, they instantly enjoyed and feel a cleaner and fresher mouth, and have no complaints with regard to the quality of the unit. They also liked that it comes with three brushing modes, making it more versatile. Just like with the Oral B Pro 1000, this model also gives little sounds, but in no way annoying. This toothbrush is still considered to be inexpensive compared to other brands and models (as an example, comparing to 1000th model), given that it has a little bit more than the basic features. Its cleaning abilities are superb, as it can brush away most of your plaques. It has three brushing modes in support of different dental needs, a leap from Oral B 1000’s single mode. It also keeps its minimalist design, which makes it very easy to clean and use. Oral B Pro 3000 electric toothbrush can also easily slipped into your luggage or purse, so you can go around with it. Since, overall, Oral B Pro 3000 gives your money worth, there are no known issues that will make you dislike this toothbrush. The sound that users have noticed can be a deal breaker for some, but if you can live with it then there really is no reason not to get this. If you think this brush lacks features or brushing modes, please check out the more advanced OralB 5000 model. 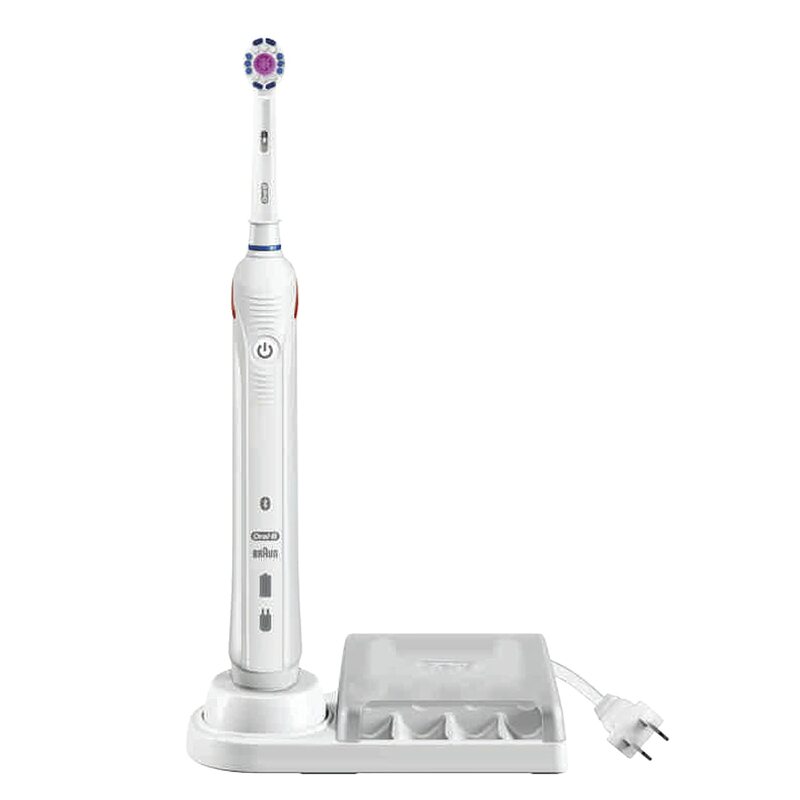 After reading my Oral B Pro 3000 review I suggest to click here to see the price on Amazon – OralB Pro 3000.